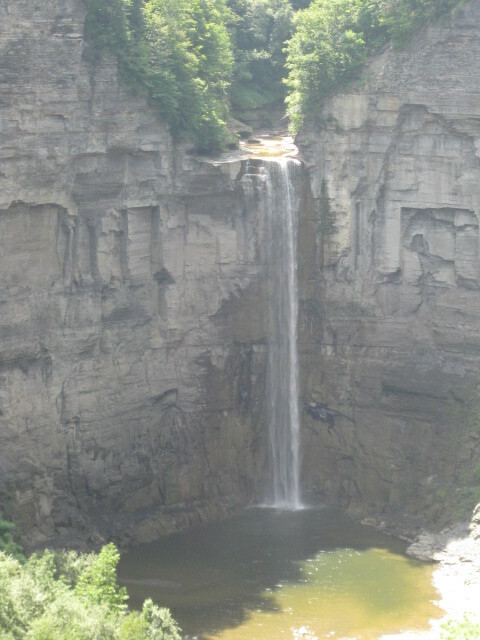 these falls started at the shore of Cayuga Lake and have worn away the rock so much that they are now ¾ of a mile away from the lake. Granted it has taken hundreds of years for this erosion to take place, but Mother Nature will always win any argument. We took the kayaks out for a short paddle on Cayuga Lake from the State Park to the mouth of the Taughannock River. The water was crystal clear and the winds were light, making it a very nice paddle. I had work to do to prepare for a workshop I was doing the next week and had to work every morning from Wed through Fri to make the final preparations for it. Wednesday afternoon we decided to drive around and check out some of the local shops and wineries. I swear I have never seen so many wineries in one area in my life! I thought the Leelanau Peninsula in Traverse City had a lot, but the Finger Lakes outdid them to an extreme. One of the places we checked out was an Amish shop. It was a neat place to browse the Amish crafts and they also sold local wines. Needless to say we tasted several and bought a bottle. While there we asked about a local site where we could get to the lake and she directed us to a state park a few miles away. We drove over and went in to snorkel for a while. The water was pretty cold (Surprise! We are in New York! ), but crystal clear. We saw lots of small fish and a BIG one that I thought was a freshwater drum. Pat saw it first and popped up and asked if I had seen it. “It was huge!” she said. About five minutes later I saw what I thought was the same fish and she was right! I guessed it was about two feet long. 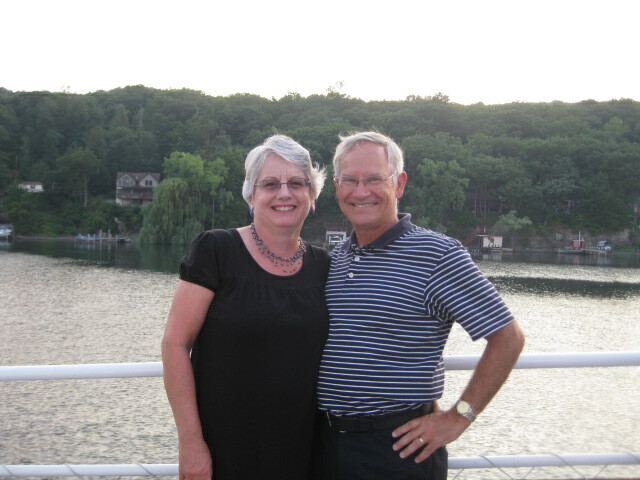 On Thursday, we checked out a few more wineries and shops and that evening took a dinner cruise on Seneca Lake to celebrate our 38thwedding anniversary. Our actual anniversary was not until August 25th, but I was going to be in DC presenting a workshop at Dulles Airport that week, so we thought it was appropriate to celebrate early. It was a wonderful night. The sky was clear, comfortable temperatures and a light breeze. The food was good and the company excellent! I finished up my work on Friday and we decided to hike a trail at the Robert Treman State Park. We thought we would hike back to Lucifer Falls and then go for a swim. Their swimming area was at the foot of a waterfall and we thought that would be a neat feature. We started hiking along the Rim Trail and the trail was pretty steep at the beginning, but then leveled out. We came up to a bridge that let us cross over to the Gorge Trail and that would take us to Lucifer Falls. About this time we had experienced a few light drizzles and thought the rain would hold off until we were close to the end of the trail. Well, we were wrong, very wrong! It started to rain and rain hard, Pat said we should try to get to the falls anyway. So we pressed on and the rain came down even harder, with thunder and lightning. We made it to the falls, often hugging the face of the cliff along the river to get out of the rain, took some pictures and headed back to the truck (about 2 1/4 miles away). The rain continued; the sky was black, the thunder and lightning continued. We were soon soaked to the skin, our glasses so streaked with water that we could hardly see and the trail was sometimes two inches deep in water. When we made it back to the truck I changed into my bathing suit so I would have something dry to drive in. What an adventure that was! I think we will definitely be more prepared the next time we do a “short, little” hike. Saturday was a work day on the trailer. Pat did laundry while I washed the trailer. The manuals suggest that you wash the roof periodically to make sure it stays in good shape. You just don’t know what fun is until you have been 13 feet up on top of a slippery trailer roof, on your hands and knees scrubbing off several months’ worth of dirt and bugs. Then the sides – I wish God had made me about two inches taller, I may have to buy a ladder! Sunday we rode our bikes around the local area, there are some really killer hills in this area! Then we generally goofed off and relaxed the rest of the day. Monday we headed out early, headed for Oneida Shores County Park, near Syracuse, NY. We decided to stay at Oneida Shores so we would be close to an airport. I had a workshop to present at Dulles Airport in Washington, DC on Wednesday through Friday. The next week I had to present another workshop in Lakeland, FL. I left on Tuesday for Dulles. While waiting at the boarding gate I thought I felt the building shake a bit. I thought it may have been caused by the movement of the jetway bridge. While I was seated in the plane, waiting for the boarding to be complete, Pat called to tell me that there had been an earthquake in Virginia and I should check to be sure the workshop would still be held. They let us off the plane and we waiting in the terminal while the FAA made sure it was safe to use the airports on the east coast. Check out my post on www.implementimprovement.com about the great customer service at Syracuse-Hancock Airport! I’ve been delayed for a lot of reasons, but being delayed due to an earthquake was a new one! Everything went fine during the week, then we heard about Hurricane Irene was working her way up the east coast. I had no problems on the way back on Friday, but was concerned that we were camped in New York and that was where Irene was headed. On Saturday Pat and I visited the New York State Fair. It was a great time checking out the displays and food booths. According to the news it looked like the storm would track east of Syracuse and we would be OK. My flight to Lakeland was going through Detroit and would miss most of the weather. I talked with Pat off and on and while Syracuse was getting its share of the rain, it wasn’t too much. My flight back on Tuesday was without incident and we pulled out the next morning to head for the Hanscom Air Force Base RV park. This entry was posted in Fulltime RV, New York, Working on the Road and tagged Cayuga Lake, earthquake, fifth wheel trailer, Finger Lakes, full-time RV, fulltime RV, Hurricane Irene, Kayaking, Robert Treman State Park, RV Forums, Senaca Lake, snorkeling, Taughannock Falls. Bookmark the permalink.